The Meet Vincent Van Gogh Experience is a multi-sensory and unique experience where you can discover Van Gogh’s life and work this 2019 in Barcelona. From March 14th until June 2nd at Port Vell. 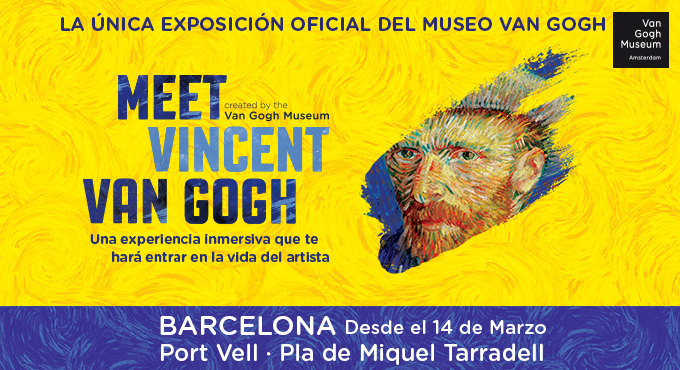 The Meet Vincent Van Gogh Experience, the first official exhibition created by the Van Gogh Museum experts, arrives in Barcelona from March 14 to June 2nd, 2019. Come the European premiere of a contemporary and fully interactive experience, which aims to show the life and work of the artist. This temporary experience, for the whole family, does not present Van Gogh’s original artworks, as they are too fragile to travel. Instead, the true story about Van Gogh comes to life thanks to the best audiovisual techniques. You can enjoy multi-sensory scenes, sets that recreate the works of the painter, intriguing narrations, and you can also see the details of his paintings through a special microscope. Supporting document or id will be requested at the entrance. Check the discount is applied during the purchasing process. Once the purchase is completed we cannot accept changes nor refunds. Enjoy tickets for 10,50eur purchasing 10 tickets or more. This groups discount is valid for all sessions except weekends and bank holidays. Please contact us: grupos@proactiv.es. Audioguides included and available in English, Catalan, Spanish and Chinese. Choose a session. Every ticket allows you to enter the exhibition between the times showed. Not before and not after. Once you are in, you can stay all the time you need till the closure. Free entrance for children under 24 months.